We all know that Mobile Legends is one of the most popular game in Philippines, with that we will guide you how to buy diamonds or recharge your account to purchase in app items and heroes. No need to use your credit card, just reload your prepaid account with the amount needed on how many diamonds you like to buy. Google Play will automatically prefer your telecommunications (i.e. Globe/TM, Smart/TNT) billing for easy payment method, you can also choose other options like credit card by selecting the drop down menu provided by the app. Depending on what network or SIM you are using, your phone (e.g. Android or iOS) will detect your network and make it as a default payment option. 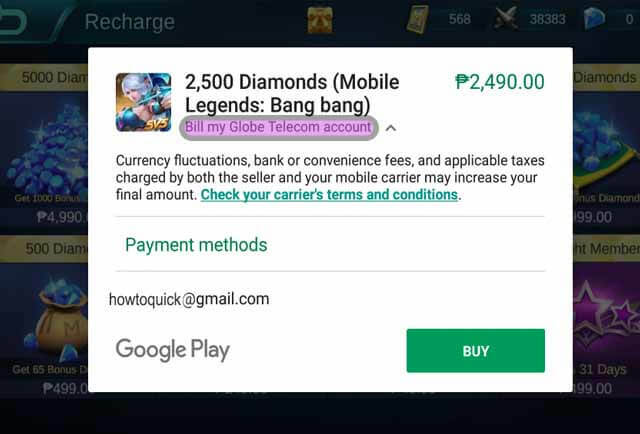 In this tutorial on how to buy diamonds in Mobile Legends we are using an Android phone. If you’re using iOS/iPhone this tutorial may slightly differ as you’ll be dealing with the iTunes Apps store purchase. Just follow the simple procedure and requirement needed to purchase diamonds in Globe and Smart carrier. You don't need to worry if you already tried purchasing game items before as this works the same like how you buy Pokecoins in Pokemon Go and gems on Clash of clans before. Open your Mobile Legends game app. Click on Diamond icon located on the upper right of the game screen. On Recharge screen, decide the number of diamonds you want to buy depending on your prepaid load. Tap on your choice, then it takes you to a Google Play purchase screen. On Payment methods, select your network account. Click Buy and enter your Google account email password, then click Confirm. Wait for a few seconds while loading, it should prompt you Payment Successful. Your additional diamonds purchased should reflect on your account. 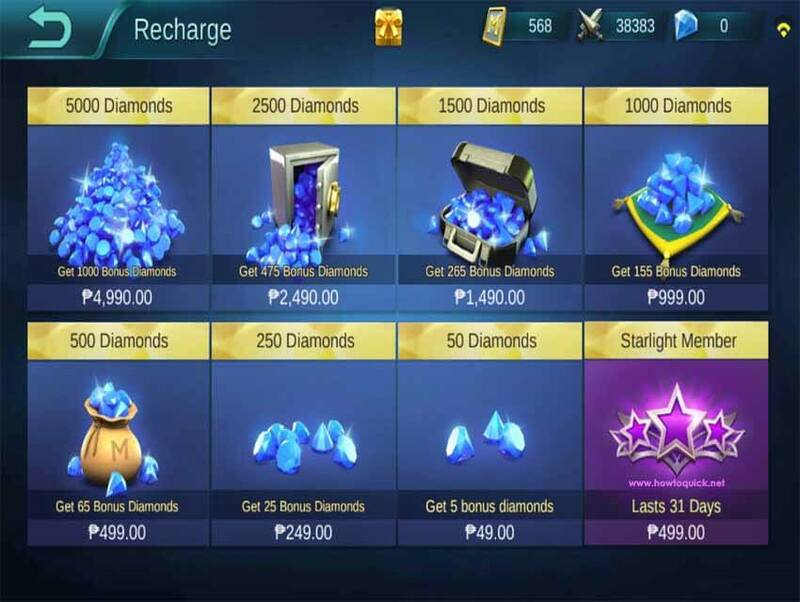 You can now also use added payment method using BPI, BDO, 7-Eleven and more to buy diamonds. That’s it. In case you’re diamonds doesn’t reflect immediately, you can restart your Mobile Legends game app. what if the notice say's recharge failed.? what am i gonna do with that coz always happen? Is your phone dual sim? If yes turn off the other sim you DON'T want to use. "Not eligible" and sometimes " the acc. verification could not be sent..please try again"
will they send the purchase statement to your email? I have 299 pesos of load so that i choose to buy 250 diamonds but it always say that payment unsuccesful insufficient balance . why i cant purchase even though i have already plenty of load ? U have to use mobile data and not wifi . magkano mag starlight member sa globe? i already have a 50 pesos load and another surfing load. do i still need a balance just to purchase? I also changed my APN to Prepaid. Please help. I need help guys how can i change dollar to peso in mobile legend to buy diamonds? The price in mobile legend diamonds are the same value with your load? I try to use recharge card and i try to buy diamond but need verification from mobile service provided.. what is that? Verifying account please try again.